At funeral Rabbi Sherki eulogizes his son, murdered by Arab driver, and is joined by chief rabbis of Jerusalem and mayor. 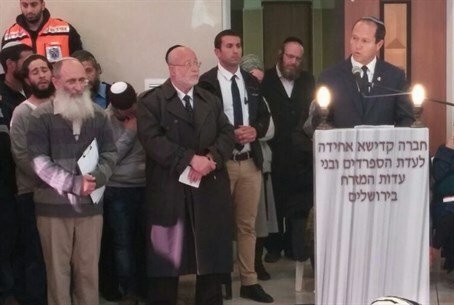 The funeral of Shalom Yohai Sherki, the 25-year-old murdered in what police say was likely a car terror attack on Wednesday night, was held in the Givat Shaul neighborhood of Jerusalem on Thursday, the same day as Holocaust Remembrance Day. Sherki, the son of prominent religious-Zionist Rabbi Uri Sherki, was murdered when an Arab driver ran over him and his date Shira Klein as they waited at a bus stop in the French Hill neighborhood. Klein is in serious condition herself, and the public is asked to pray for her recovery. At the funeral at Har Hamenuchot cemetary, Sherki's father said: "for you my dear son it isn't difficult because your noble soul is ascending directly to the King of Peace. Not only did you merit to be among those killed for (G-d's) Kingdom, but in your death you also saved the life of the woman who stood by your side. You had an exalted soul." "As is your name so were you, all those around you make peace (Shalom - ed. )," continued Rabbi Sherki. "Always, in every place you appeared, wherever there was tension you brought peace. You were red-haired like King David." Rabbi Sherki said "we returned to this land not in order to be murdered. A desecration of G-d's name was committed in your murder." "Sanctification of G-d's name will come from our individual work and that of the government, which will plant (the people of) Israel more in its land," he said. "Love of G-d was in your every heartbeat," concluded the bereaved father. "You loved the Torah with all your heart. Your study was hidden. You spread your shelter on everyone." Michael Sherki, the brother of Shalom, took the podium at the funeral and sang the song that he wanted to perform at the wedding of his brother. "We grew up in the home of one killed (for G-d's) Kingdom and we didn't know it," said Michael. "Thank you for waiting for us, and we all were together to part from the soul." Speaking about Shalom's work as a tour guide, he added "I thought today about all of your circles - how many sad children you are leaving behind." "You didn't have us meet Shira for whose recovery we pray," added Michael, speaking about Shalom's date. "A while ago I asked 'when are you going to clear the room for me?,' but I didn't think (it would happen) like this. You left me alone. I saw the pictures from the attack - there's no doubt it wasn't an accident, and no censor will cover it up." The Chief Sephardic Rabbi of Jerusalem, Rabbi Shlomo Moshe Amar, also spoke at the funeral eulogizing the young Sherki. "The (Jewish) month of Nisan is a month of redemption, but not for us this time with great losses and now - deaths (for G-d's) Kingdom," said the rabbi. "Such a harsh decree." Sherki was "a righteous man, the son of righteous ones," said Rabbi Amar. "Who can take in the scope of this decree? But let us not think that if we say 'the righteous atone (for the generation)' that will calm us - it makes the soul storm that we need a sacrifice like this." Addressing Sherki, the rabbi said: "be a shaliach tzibor (prayer leader - ed.) and don't stop shouting the screams of the people of Israel - for how long G-d? For how long will Jerusalem be given to cruel and evil hands? Stand in prayer and don't be silent." Jerusalem Mayor Nir Barkat also spoke at the funeral. "Jerusalem is wrapped in your sorrow. In the ongoing campaign we continue to take difficult losses, but we stand firm and strong, just like the path and values of the Sherki family," Barkat declared. Jerusalem's Chief Ashkenazic Rabbi Aryeh Stern noted the bitter significance of the murder occurring on the eve of Holocaust Remembrance Day. "When it's a eulogy that touches the entire community, we eulogize in the month of Nisan. Today is Holocaust Remembrance Day, which comes to remind us what the Nazis - may their names be erased - wanted, to destroy and kill all of the Jews." "We also need to understand and confront it," said Rabbi Stern. "The sons of Aharon (the first Kohen and brother of Moshe from the Torah - ed.) also died in the month of Nisan, and of them was said 'I will be sanctified by those close to Me...and all the people of Israel will cry the flames which G-d burned' - so too for us today."